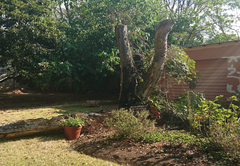 The Slumber Thatch is one of the Murrayfield guest houses and provides accommodation in 2 guest rooms for tourists visiting the Pretoria region. 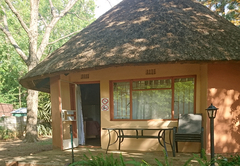 The Slumber Thatch provides accommodation for up to eight guests in the Murrayfield Security Village which is a gated community. Next to the N4 and close to the N1 national roads, we are the ideal stop over no matter which direction you are traveling through Gauteng. We are en route and only 3.5 hours away from the Kruger National Park by car. 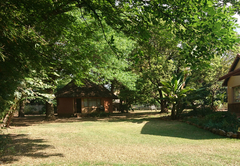 The Slumber Thatch guest house is a large property with lush gardens and many big trees. 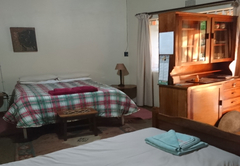 There are two semi self catering units available sleeping four guests each. This is an en-suite bedroom with a shower, washbasin and toilet. It is situated off the kitchen of the main house and has its own entrance. There is one single size bunk bed which sleeps two and a separate large size single bed. A fourth guest can be accommodated, an inflatable mattress with sleeping bag and pillows can be provided. It has a food and beverage area with microwave, kettle, toaster and crockery and cutlery sufficient for 3 to 4 people. This room has access to shared fridge and freezer space in the kitchen. This is a rondawel that is freestanding and separate from the house. It is secluded and very private. 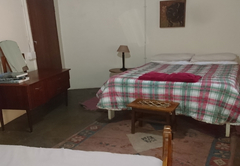 There is a Queen-size bed, a large size single bed and a fourth guest can be accommodated on an inflatable mattress with sleeping bag and pillows. 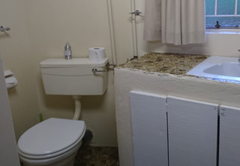 The bathroom has a large shower, washbasin and toilet. There is a kitchenette with microwave, kettle, toaster, large fridge, crockery and cutlery. The veranda has a four seater table. All beds have bottom and top sheets and duvets, two pillows and pillow cases. Extra blankets are supplied. The cupboard space has shelving and hanging space with hangers available. 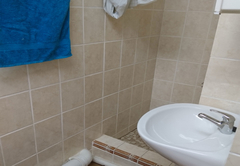 We supply a bath and hair towel to each guest. Limited toiletries and toilet paper is supplied. 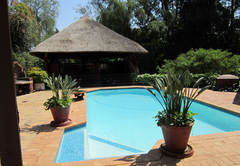 Guests have access to the garden, pool and braai area. The main lounge is also available for guests to use and has a TV with Netflix. Secure parking is available for guests. Private airport shuttles, trips around town & guided excursions as well as various meals can be booked with us. Close to many business centres, corporate parks and malls like CSIR, The Innovation Hub, Route 21, The Grove, Glenfair, Lynwood Bridge, Brooklyn and Menlyn Maine with shops, cinemas, ice rink, gaming arcades, gyms, casino and Time Square Arena. 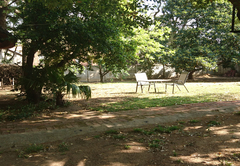 We are also close to various hospitals, clinics, golf courses and the National Botanical gardens. We are a mere 2.2 kms from the International German School. Eating out is easy with simple café's to upmarket restaurants all in close proximity. Quite a few places of interest are within walking distance. We are on a municipal bus route, close to the Gautrein and Gautrein bus route and serviced by Uber. Backpackers Dream: is an en-suite bedroom. This is situated off the kitchen of the main dwelling and has its own entrance. 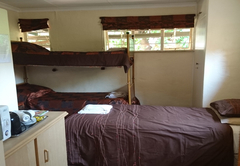 It has 1 bunk bed single size (sleeps 2 – top and bottom) and a separate large size single bed. For a fourth guest we supply an inflatable mattress with sleeping bag and pillows. The bathroom has a shower, washbasin and toilet. It has a food and beverage area with microwave, kettle, toaster and crockery and cutlery sufficient for 3 to 4 people. A rondawel type dwelling standing free and very private in the secluded garden. 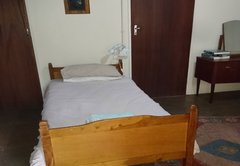 It sleeps 2 people in a Queen-size bed with Cloud 9 mattress, 1 person in a large size single bed and for a fourth guest we supply an inflatable mattress with sleeping bag and pillows. 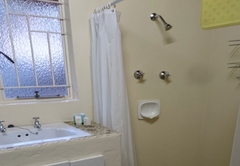 The bathroom has a large shower, washbasin and toilet. 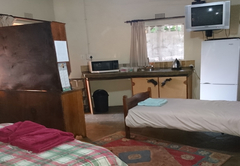 There is a fully equipped kitchenette with microwave, kettle, toaster, a large fridge and crockery and cutlery sufficient for 3 to 4 people.